1 PLACE chicken on cutting board and cover with plastic wrap. Pound to 1/2-in. thickness with bottom of heavy skillet or rolling pin. (This will help the chicken cook more evenly.) Season chicken with paprika, salt and pepper. 3 POUR water into skillet and bring to a boil. Stir in Knorr Selects™ Spinach Florentine with Penne Pasta and return to a boil. Boil, covered, over medium-high heat, stirring frequently, 10 minutes. 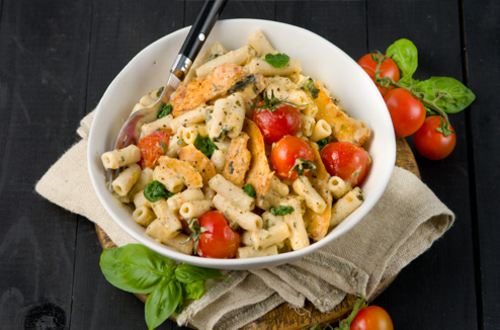 4 SLICE chicken and stir into Pasta, or top individual servings with sliced chicken. Garnish with basil, if you like. Enjoy!